Site Four is an interesting facility located on the east boundary of TTR, about 12 miles east and slightly south of the TTR headquarters. Access to Site Four is provided not only from within TTR, but also from a gate on TTR’s eastern boundary. 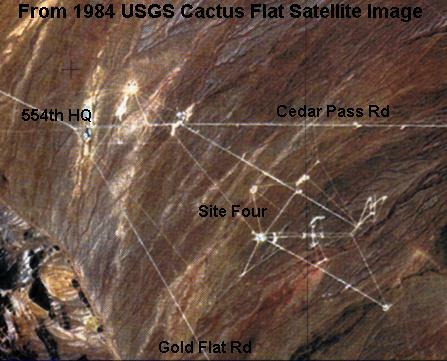 From this “Site Four Gate”, as it is called on some maps, a high quality dirt road (similar to Groom Lake Road) heads east and connects with Hwy. 375. Site Four is a component of the Tonopah Electronic Combat Range (TECR), operated by the 554th Range Squadron. The TECR performs a number of functions, but primarily, they assist in the training of pilots participating in the various Flag exercises (Red, Green and otherwise), held at Nellis. This involves simulating various potential adversarial radar and electronic threats (Russian, Chinese, Iraqi, etc.) so our pilots learn how to safely deal with them. The best way to simulate the actual radar the other side uses, is to use the same radar. That’s where Site Four comes in. Over the years, through all sorts of clever means, the US has acquired a hardware collection of many radar systems from around the world, including Soviet made units. These units were taken to Site Four, tested, evaluated, operating parameters noted and weaknesses defined. That complete, electronic countermeasures (ECMs) were developed for our pilots to safely deal with these hostile units in a combat situation. Also, Site Four was likely instrumental in the stealth test program. There’s no better way of knowing just how invisible your plane is to an enemy’s radar, than by actually flying the plane against your own copy of that same radar. Considering that some of the units might have been obtained through surreptitious means, Site Four in years past was considered quite a secret and sensitive site. Discussions with a former TTR worker from the Stealth fighter era, revealed a few interesting pieces of information. The workers at TTR’s main complex considered Site Four even “more secret” than their own complex. People bound for Site Four had to pass through another gate within TTR before gaining access to Site Four. And oddly, while workers at the main TTR complex were allowed (and perhaps even encouraged) to live in one of the nearby local communities, this was not the case for Site Four employees. They were required to utilize the commuter flights from Las Vegas. Site Four sits by itself on a large plain. It is easily observed from a number of locations, although from a distance. It is a large complex, spread over several miles, with some of the buildings widely separated. There are a number of towers containing various antennas, including steerable microwave dishes, but there are also some towers devoid of antennas. There are a number of earthen covered bunkers, indicating storage of either explosives or other dangerous materials, but these may be left over from the very old WWII training days. The 554th Range Squadron O & M (Operations and Maintenance) headquarters building is visible, a large two story office type structure. Surrounding it are a number of other industrial style buildings. No airstrip was observed, but other maps indicate the presence of a heliport. Could this site be the genesis of the “S-4” saucer stories? Probably not directly. The S-4 of legend is built into the side of a mountain, while this facility lies fully exposed, sprawled across a plain. Further, there have never been any reports of disc shaped objects associated with this place (although it’s certain many strangely shaped stealth aircraft have been flown over it). But in years past, the place was quite secret and hush-hush, which could have spawned rumors regarding alien goings-on, probably to the delight of the staff there. So unless the name was “borrowed” by someone with an overactive imagination, and transplanted to Papoose Lake, there is no evident connection.